CALAIS, France — Rahmanjan Safy scrambled to salvage anything valuable from the demolished tents and makeshift shelters at this Calais migrant camp Wednesday, even as riot police and bulldozers destroyed the site. Food, clothing, spoons — he picked up everything he could find. Safy, 25, from Jalalabad, Afghanistan, has been in France since 2009. He once lived in this camp but now works with an organization that helps the migrants and refugees. Driving his big white truck, he moved these precious commodities to a section of the camp still intact, so people could still use them. 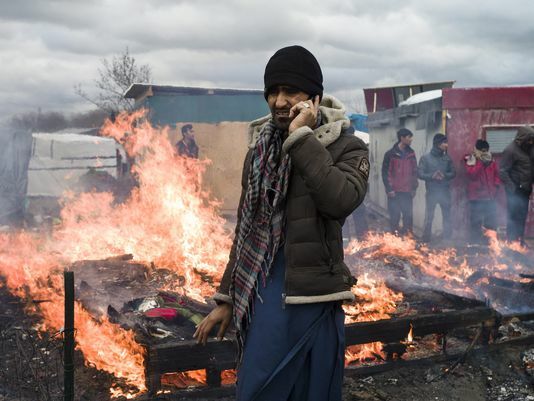 A judge gave the green light last week for the French government to tear down part of the Calais “Jungle,” as the camp is commonly called, but riots broke out this week amid the resulting chaos. Police and bulldozers began pushing migrants out of tents and temporary shelters Monday, tearing apart the ad hoc camp that houses an estimated 6,000 people. Camp residents fought back, starting fires and attacking police with rocks. The situation Wednesday was calmer, if not less tense. Confusion, uncertainty and sorrow still hang over the camp and the people who have no place to go. Ahmed Salah from Sudan stood amid trash and debris, mourning the loss of his home of seven months. He says he wants to leave but can't. The French government initially announced its plan to dismantle the southern part of the camp — closer to the highway — in early February. Migrants in that section would attempt to jump on trucks crossing through the Chunnel, despite barbed wire set up to protect the road. The rest of the camp is being left alone — for the moment. French authorities defended their move to dismantle part of the Calais camp, while also saying France remains open to refugees. But volunteers described how people rushed to collect their few belongings in a short amount of time and tried to salvage parts of their shelters for protection against the cold weather. “They gave people one hour to assemble their belongings,” said Christian Salomé, founder and head of L’Auberge Des Migrants, the main organization that distributes food and clothes at the Calais camp. "It is sad and inhumane to expel people from their homes in the winter and by destroying their shelters." Other volunteers call the entire situation shameful. Many fear that with the conflicts intensifying in Syria, Iraq and Afghanistan, the wave of refugees will be even greater this year. In downtown Calais, just a few miles from the camp, outrage over the situation has been growing for more than a year. Business owners like Jean Claude Burei, who has a restaurant in town, want the government to find a long-term solution because the bad publicity over the camp keeps tourists away. French President François Hollande and British Prime Minister David Cameron will meet Thursday in Amiens, France, to discuss the ongoing migrant crisis ahead of next week's EU summit on the issue. Hundreds of British volunteers at the Calais Jungle, like Malcom Mitchel, 69, do what they can. Amine Khan, 31, from northern Afghanistan, helplessly watched the bulldozers Wednesday and said his "home" will likely be next.